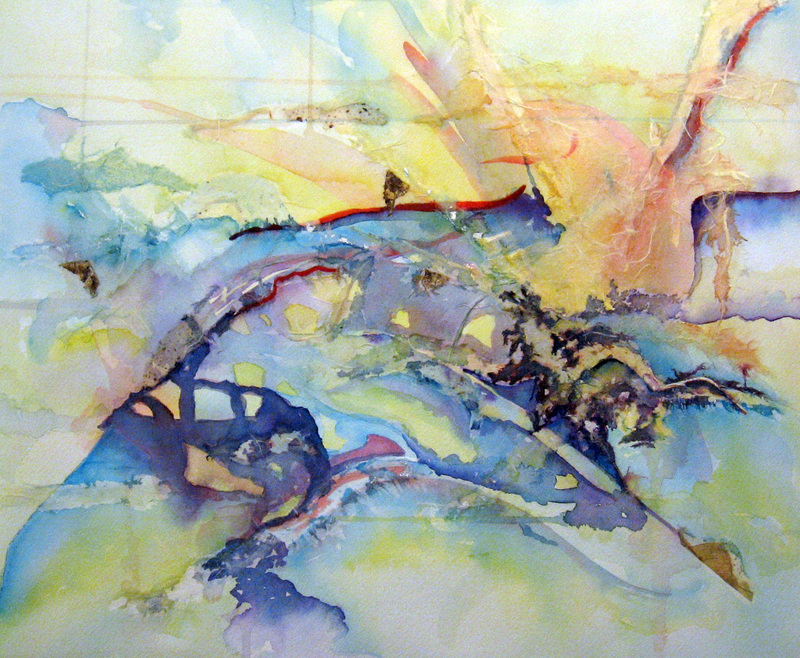 This is a new abstract using the rice paper collage with watercolor. As I worked on it, I saw a dove appearing in the upper right quadrant. I couldn’t help but to bring that dove forward and let it be about her, or him. 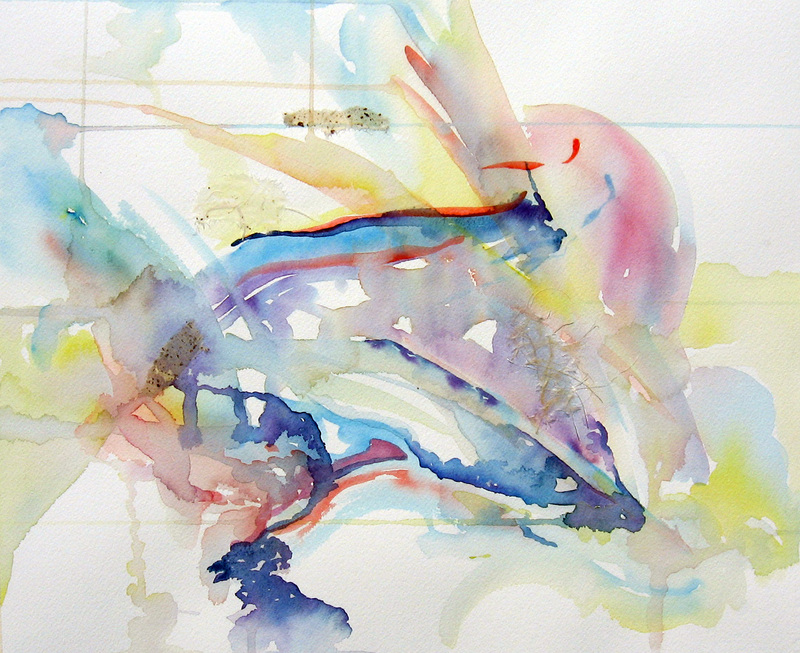 I began, as usual, working toward abstract washes and marks and allowing the watercolor to mingle. I glued some torn rice papers on the surface with glue made from one part water and three parts acrylic matte medium. You can also make a mixture of water and PVC glue or acid free Elmers glue. All three work for these. I waited for the glue to dry and painted some more. As I work these stages, I prop the painting up on my mantle and move away from it and study it as I wait for it to dry, sometimes overnight. I will turn the painting all different ways and search for imagery in it, especially areas where I can develop a center of interest. I began to see an image of a dove appear and started darkening the shapes around her by adding more papers and painting around and through them. 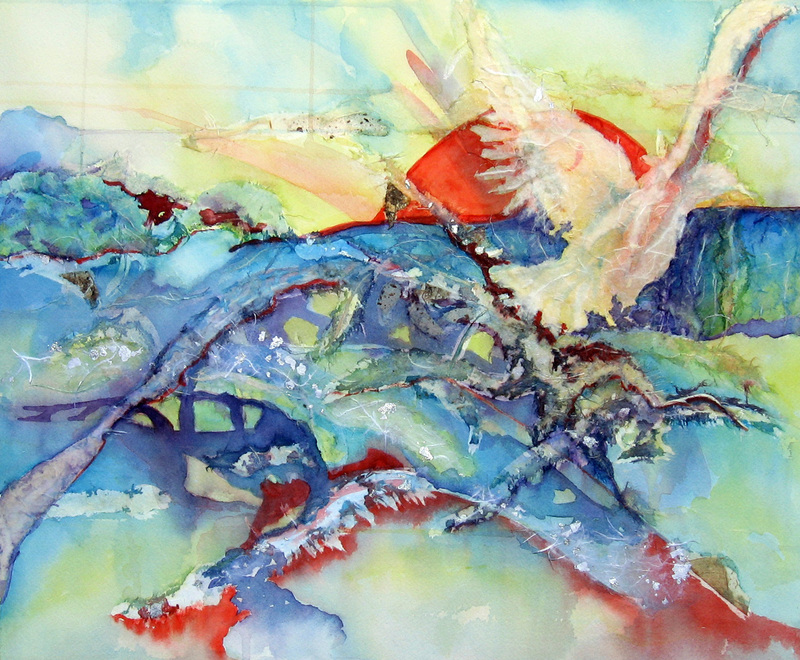 As the dove came forward, I felt it time to begin balancing the red of the sun and describing the background just enough to suggest a few things like a horizon line, a watery landscape and maybe a bridge, trying not to get too detailed. I want to let the viewer see their own story in this so I just concentrate on guidelines of composition like values and contrast of shape and line and color combinations. I like it that these pull out a viewer’s imagination. To finish the painting, I darkened and textured the the blue water behind the dove and carried that darker color over to the left. 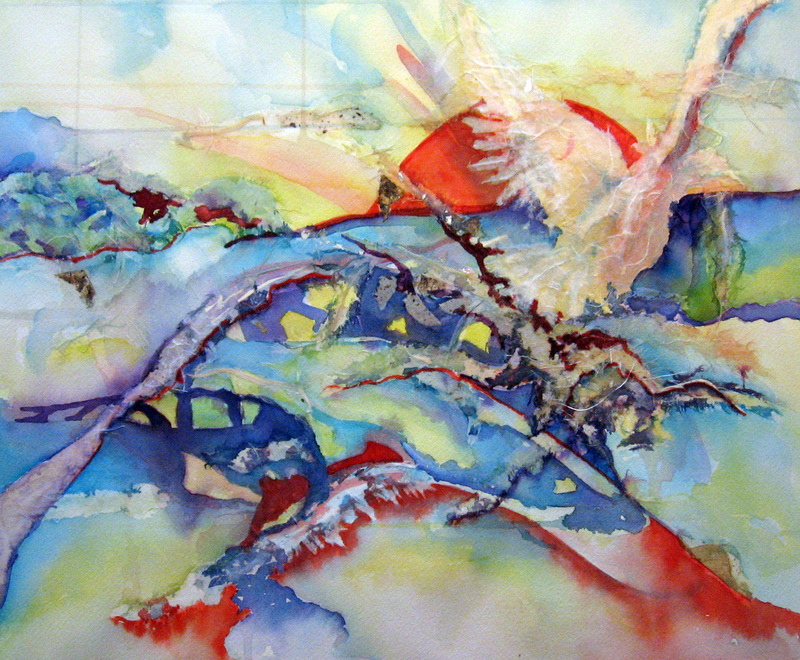 I added a rice paper that had little silver bits in it to the waterway under the bridge and softened the abstract shapes under the dove by adding some more stringy rice papers there. Once again, my class is working with watercolor and rice paper collage. I always encourage them to create an abstract for their first assignment. We use the same glue (acrylic matte medium with a little water mixed in so it is not so thick) and tear our rice papers or cut them and glue them to our painting. We, then, go back in and paint some more as each layer dries. 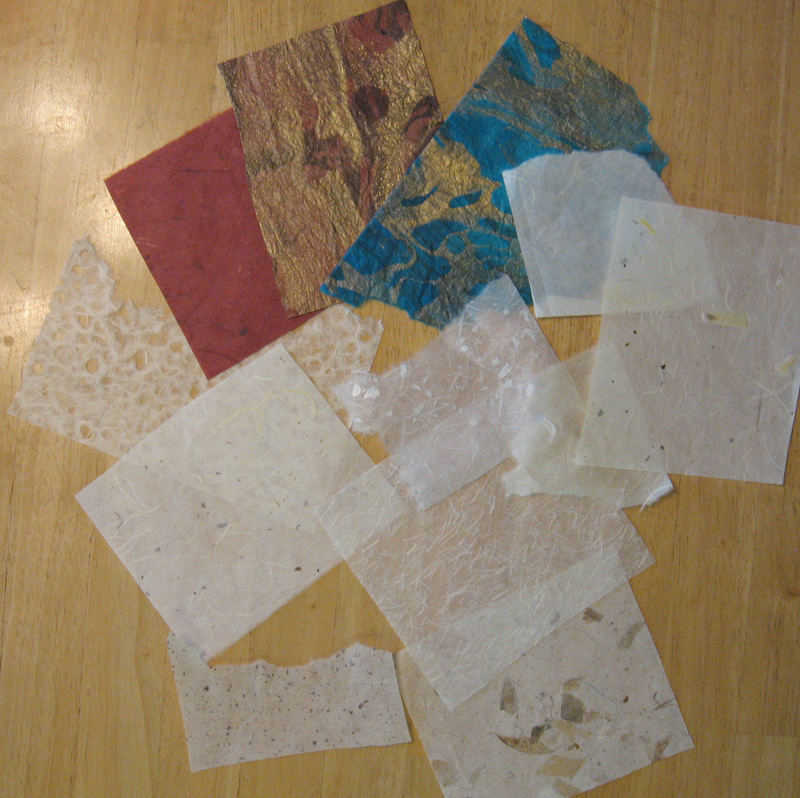 Above are some examples of rice papers I use. 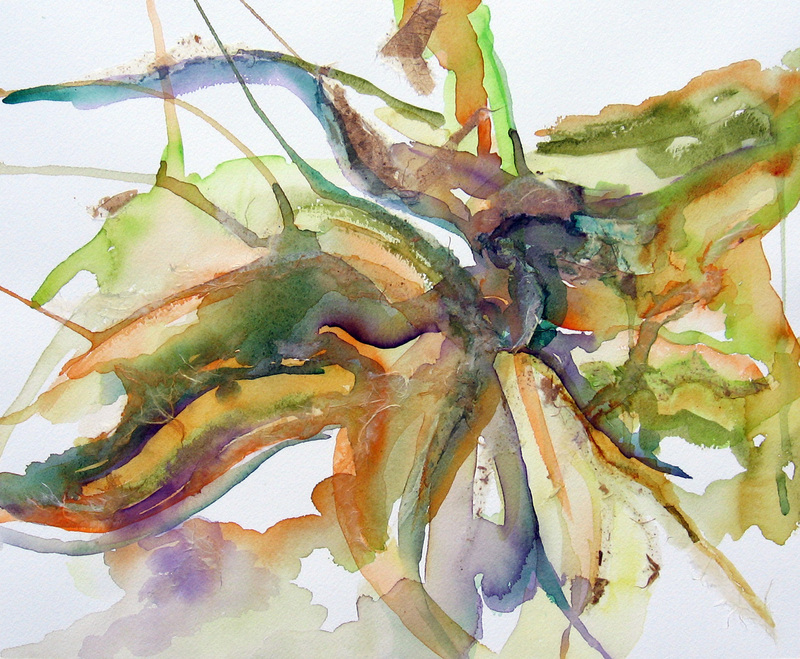 We begin by choosing a color palette and making marks on our watercolor paper in abstract patterns. This phase can include drips (by turning your wet painting several directions), splatter, light and loose washes and marks with different brushes. I always advise my students to keep some of the white of the paper and ask my students to look for potential areas to work toward a center of interest on or near a “sweet spot”. In the above painting, it is that area that is so dark near the upper right sweet spot. I wait for this initial wash to dry and then begin tearing and cutting different rice papers and adhering them to the paper with the glue I made. Make sure you use only enough glue to adhere the paper. Too much glue dries thickly and interferes with future applications of watercolor. The above photo has some rice papers already glued into it. I try not to think too much in the first layer. I am always working toward the area that I think will become my center of interest. I try to allow the painting to tell me what it wants and try to not get too dark or muddy in the first two layers. The gluing phases of these creations always takes longer to dry, so I try to have two paintings going at the same time and alternate between the two. 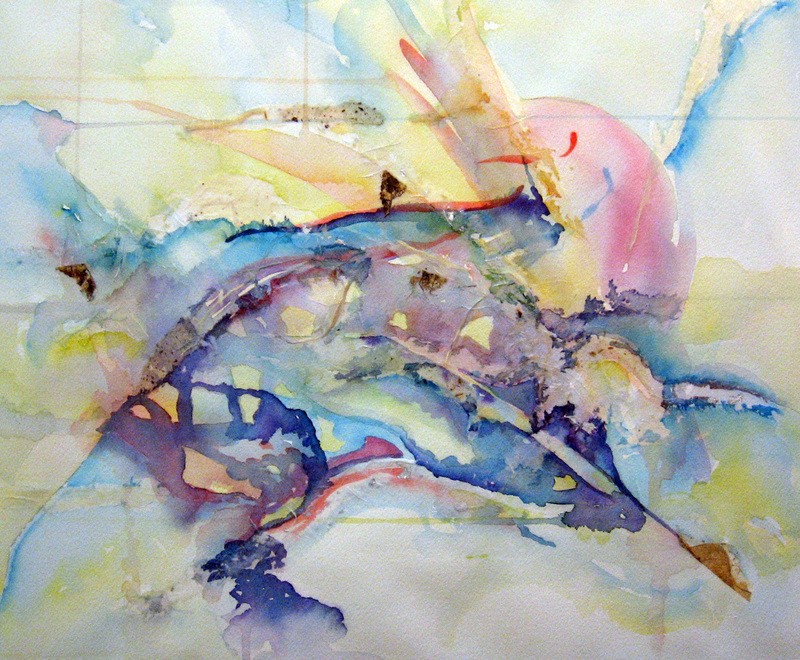 The above image is what my painting looked like after three layers of rice papers and watercolor painting. My center of interest was still not strong enough and I wanted to add more gold and some of that lime color to make it pop some more. 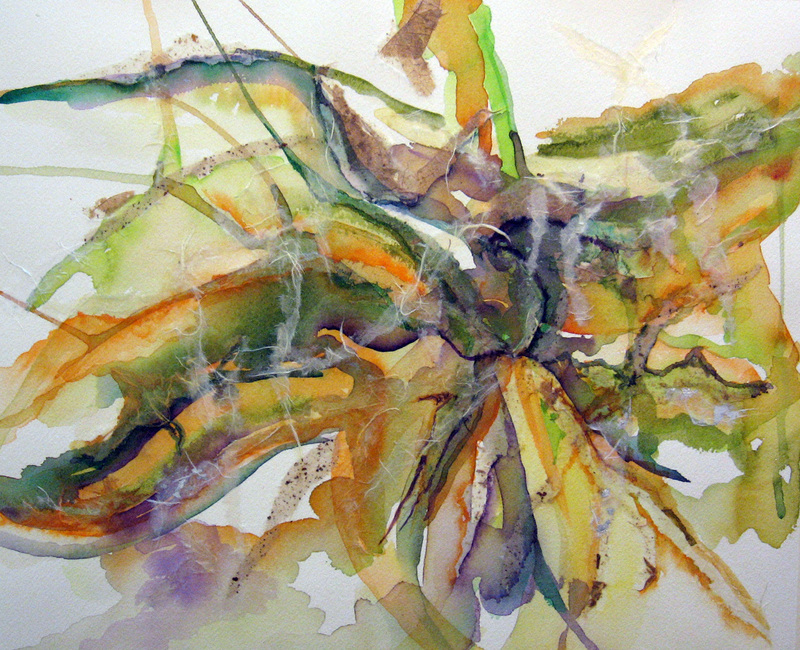 In the above, you can see I added those greens and golds to grab the viewer’s eye. Then, I chose a rice paper with some shiny silver things in it and designed a moon-like image on my sweet spot. I chose to lead the viewer’s eye there with some torn strips of that sparkly paper. After that dried, I took a small round brush and darkened some lines and shapes leading to the moon with diox violet. Here is one I created last year. I really like that I never know what I am going to get. It allows me to relinquish some of my control and let the values, lines and shapes draw me into what is forming on the paper. 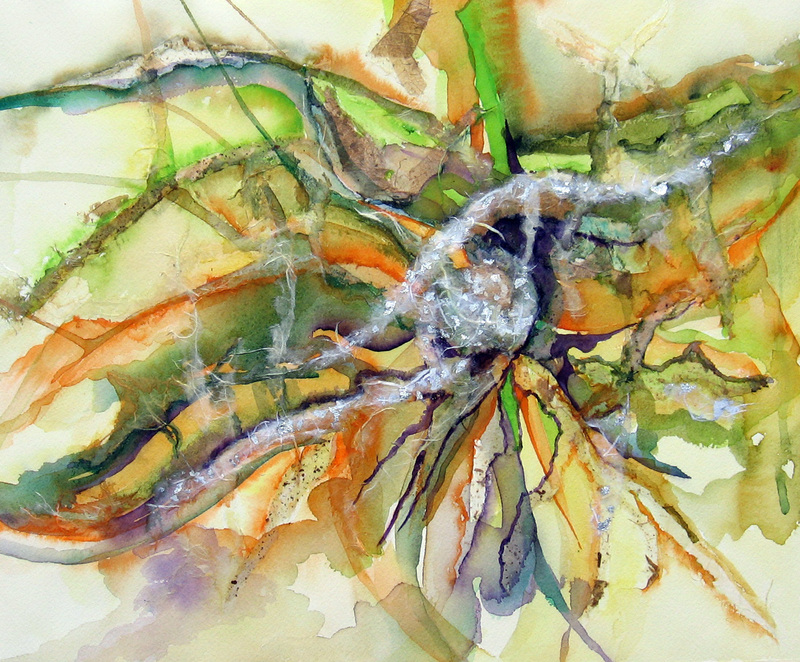 No two paintings are ever alike and there are endless possibilities! 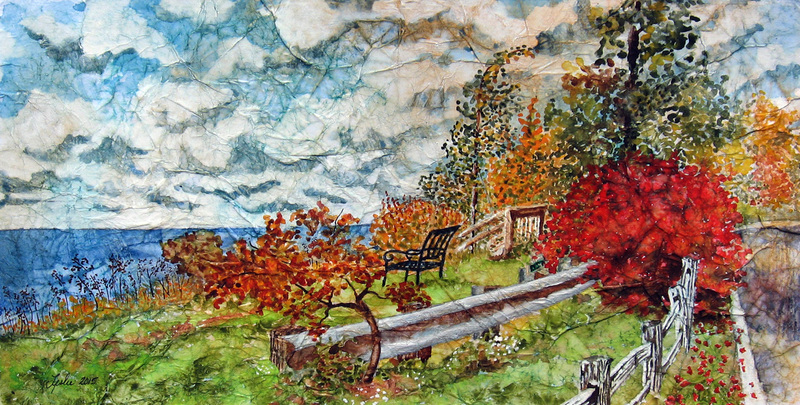 I had so much fun working with this scene on masa paper. My sister has been generous enough to share photos of her journeys along the east coastline of Lake Michigan. She is a “lake girl”. I fell in love with the colors of this scene and the chair waiting for someone to come and sit in it. Thank you, Sis! 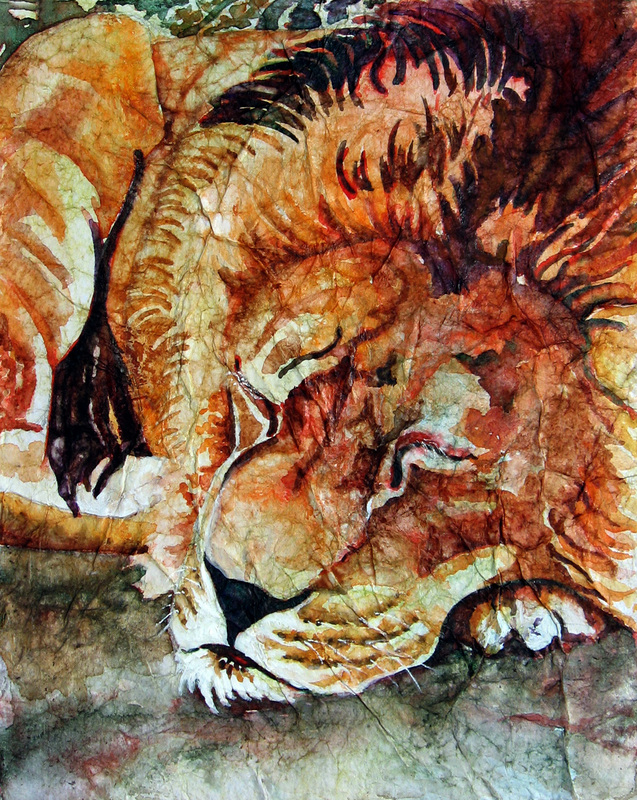 This lion was painted on masa paper, a rice paper that can be crinkled, soaked in water, toned, dried and glued to the surface of watercolor paper in order to provide a watercolor artist a different surface to paint on. 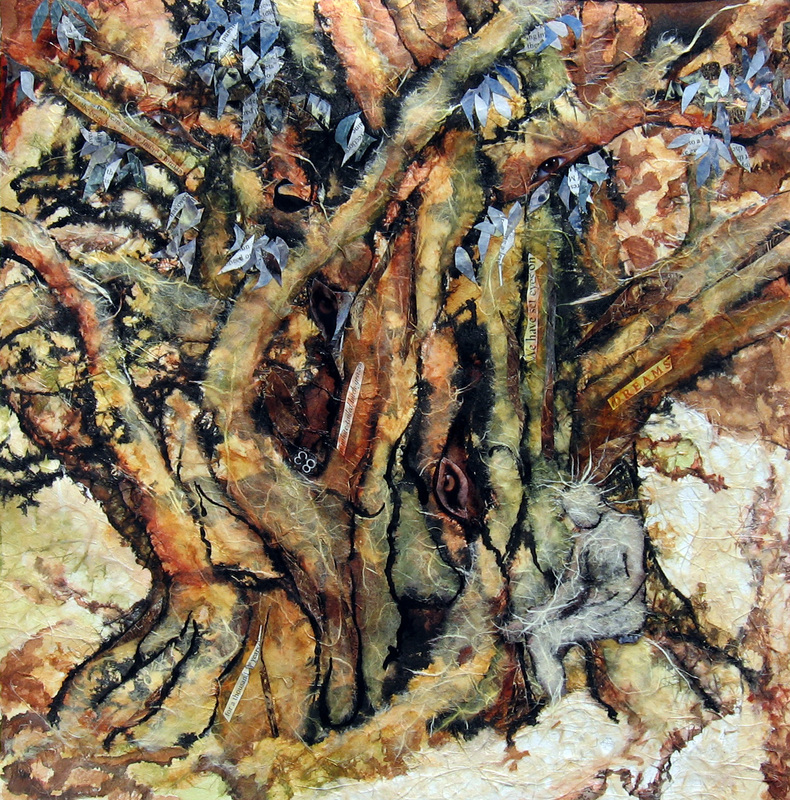 The textural possibilities are varied and, oftentimes, very interesting. They, generally, take me longer to paint, but the extra time spent is well worth it. I have several tutorials. The first one is located here. The update is located here. If you would like to view a selection of the paintings I have completed on masa, just click the tag, masa paper, under the title of this post.